We left our B&B at Chierry, the Ferme de la tuèterie, around 11 am, and headed east to Fossoy, Mézy and Chartèves. It was a cool day, partly cloudy and a little breezy, so I chose to wear my long tights. I was glad that I did. The day's route was a loop to the north to reach areas where the 42nd Division fought battles in July 1918. The church bell rang at noon as we cycled through Chartèves. We were starting a climb up out of the Marne River valley. 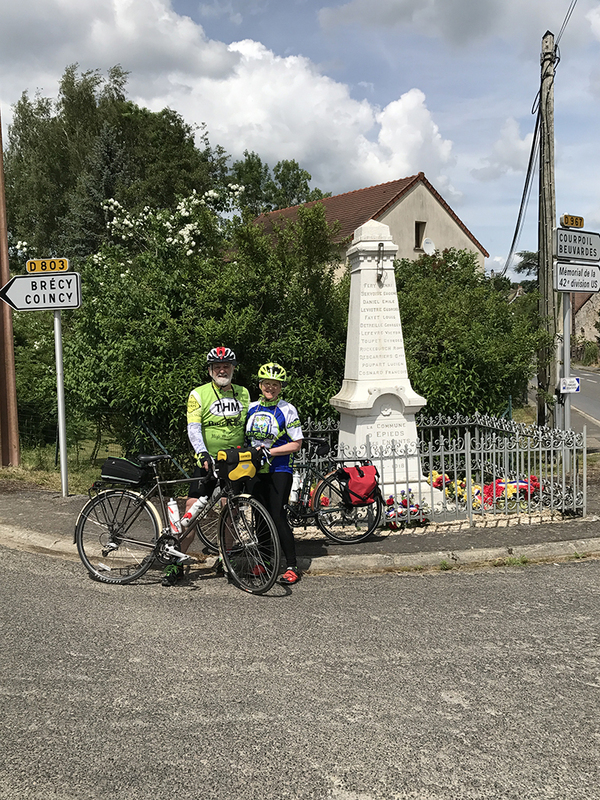 At Jaulgonne, we began a climb that lasted well over 3 miles to Le Charmel and beyond (I checked the actual distance later, and it was only 2.5 miles from the start of the climb to where we finally reached level ground.) With our bikes in a low gear, we made steady but slow progress up the hill. There was not much car traffic, and we even encountered a few bicycles along the way -- going the opposite direction. We noticed road markings for a bike tour, and when we reached Le Charmel, we saw a sign for a Rando-Velo (bike tour) event being held that day, and then we understood the several cars we had seen with bikes on the back. One car of two young people honked and waved at us. 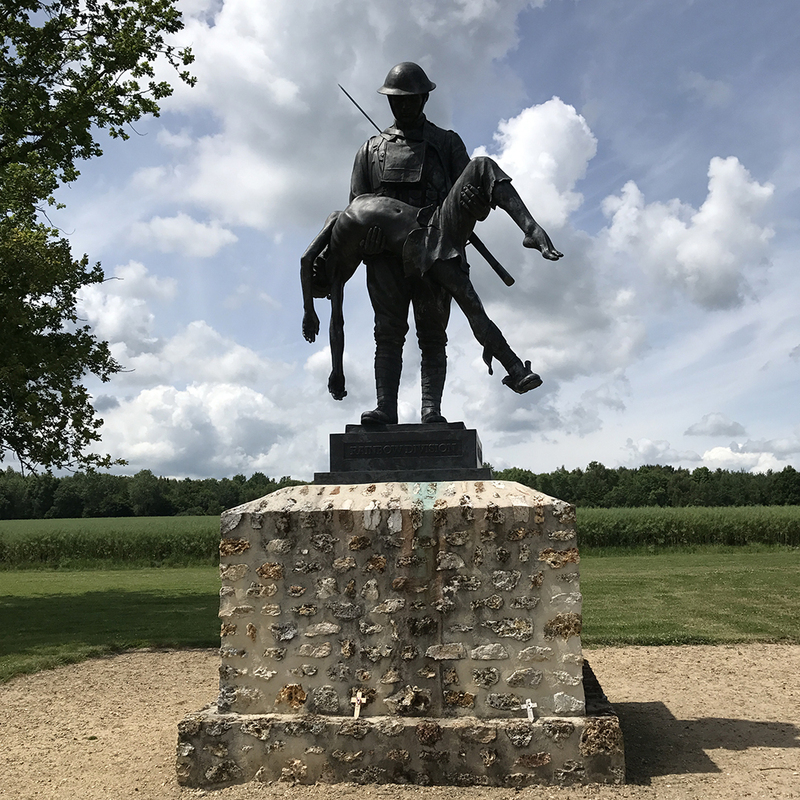 We rode an overpass across the Autoroute (interstate highway), and shortly after, we came to the Memorial for the 42nd Division at Croix Rouge Farm. We took lots of photos of the memorial there. It is a poignant bronze figure on a stone pedestal, depicting an American soldier carrying the lifeless body of a fellow soldier. I first learned about it when I searched the internet for information about where the 42nd Division was on the day that my cousin, Harry Swift, was wounded (July 27, 1918.) I saw a photo of this memorial and knew that I had to come see it in person. The action at Croix Rouge Farm occurred the day before Harry's injury. The Iowa Regiment (168th) was fighting alongside a French regiment and an Alabama regiment (167th.) As they moved from Èpieds (just a few miles north of Château-Thierry, they met retreating French troops and civilians, pleading with them to turn back -- the German troops were just a few miles ahead, and they were well dug in. The Alabama and Iowa regiments were relieving elements of the 26th Division (the Yankee Division), who had been pushing their way northeast. This was not trench warfare. The Americans, said one French soldier, "are in a hurry." They were fresh troops, particularly in relation to the French infantry who were battle weary and exhausted from four years of battle. The Germans had been somewhat surprised by the arrival of the Americans in that region. They were rather hoping, after Russia had pulled out of the war, they could push their way westward to Paris and end the war before the American army had a chance to engage. 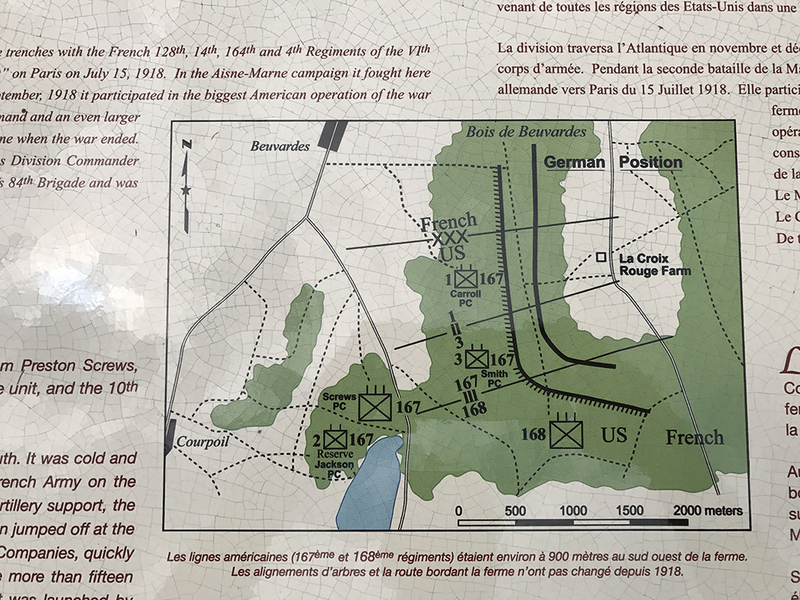 But at Croix Rouge Farm, the Americans were so relentless that the Germans were forced to abandon guns and ammunition stores in the woods at Bois de Beuvardes. And the American commanders kept their troops on the move, so they did not have time to dig foxholes before they were ordered to move forward again and out of the woods. The fighting destroyed the farm, and the ruins of one of its stone walls are all that remain today. Croix Rouge Farm (the remains of it) are near the center of this photo, taken about a quarter-mile south of the site. This is the approximate approach which would have been taken by the Iowa troops. The Iowans moved along the road and north toward the farm. Harry Swift's company spent the night in the woods, and they did not have time to dig in before they were ordered to move on and push north to try to drive the Germans back across the Ourcq River. July 27, 1918 -- the day Harry Swift was injured -- was an awful day for the men from Washington County, IA. They were fighting with Company K of the 168th Infantry. The company was moving from the Forêt de Fère toward the German line on the north side of the Ourcq River. Having occupied the higher ground for weeks, the German artillery was extremely precise in their targeting, and Harry's platoon caught the brunt of the shellfire. Dewey McAvoy, Edward Claffey, Floyd Wallace, Homer Hawkins, Orville Means and John Flannigan -- all Washington, IA, men -- and Allen Hanft, from Columbus Junction, were all hit (mostly with high explosive shells, though Flannigan was hit with machine gun fire), and all died. Wayne Simerman, Harry Swift, Glen Schuster and others were wounded. (Harry was injured by exposure to gas shells, which the Germans fired as the U.S. troops retreated on the 27th to fall back into the woods and dig in.) Despite losing nearly half of their number, the 168th pushed on to cross the Ourcq, and the German troops fell back. 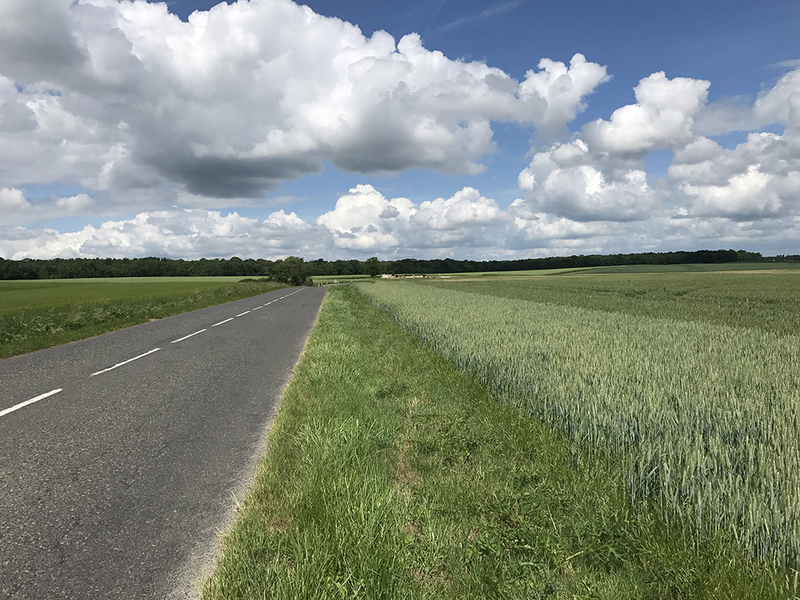 After we left the Croix Rouge Farm, we bicycled north on D3 toward Fère-en-Tardenois, but we turned west at the first road and moved through the Bois de Beuvardes. We stopped briefly at a logging road to step into the woods and look around. 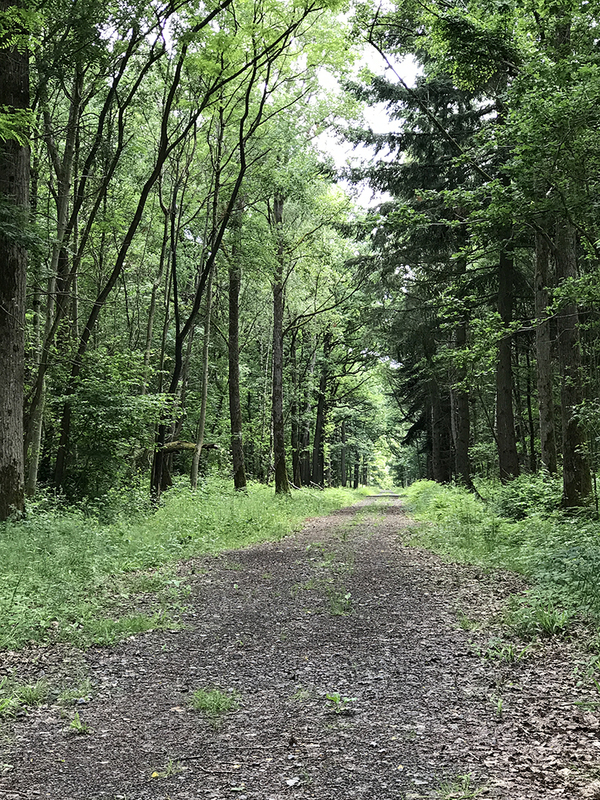 The journal of an officer in Harry's company remarked that the denseness of the woods contributed to the difficulty of the fighting -- it was so dark in the woods that the men could not tell if moving forms were Germans or U.S. soldiers. 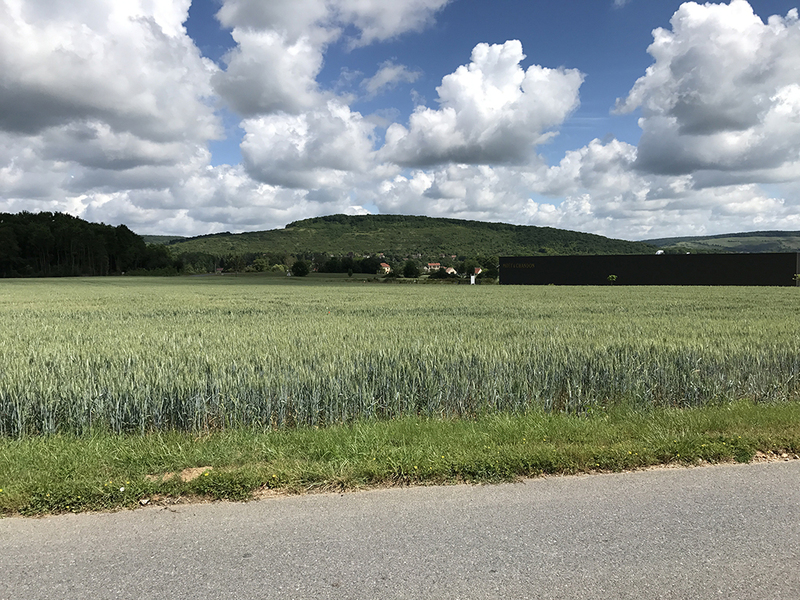 We cycled back to Château-Thierry through the tiny village of Èpieds, where the French truck convoy had deposited the men from the 168th Regiment on the night before the moved toward the Croix-Rouge Farm. There was a small carnival in Èpieds for the holiday weekend (Whitsunday), so we stopped and took a few photos there. We started a descent into Château-Thierry at Verdilly, flying downhill and around several curves until we rolled on the main avenue. It had been a long day, and we had not had a bite to eat since breakfast. But we were planning to join three guys from the B&B to go out for dinner when we got back to our overnight spot, so we didn't want to get a meal at this point. But we needed coffee and a little something before making the 1.5-mile climb back up to the B&B, so we stopped at the Restaurant Jean Fontaine at the end of the bridge over the Marne and got two coffees and two pieces of apple torte. Those were enough to fuel our ride back up the hill. As we pulled into the drive at the B&B, the innkeeper M. Riera and his wife were sitting in the garden visiting with two overnight lodgers who had just arrived that afternoon from Erlangen, Germany. We gave them hearty greetings, and M. Riera brought us two cold beers as we put our bikes up for the night. The guests from Erlangen, Corinne and Alexander Friedrich, were friendly and cheerful. I recognized the traditional Bavarian clothing that Herr Friedrich was wearing (lederhosen and a forest green jacket with red trim) and was happy to finally be able to converse with one of the other guests. When Steve and I lived in Germany, we were not far from Erlangen, and Herr Friedrich's mother was from Bayreuth, the town where we had lived. 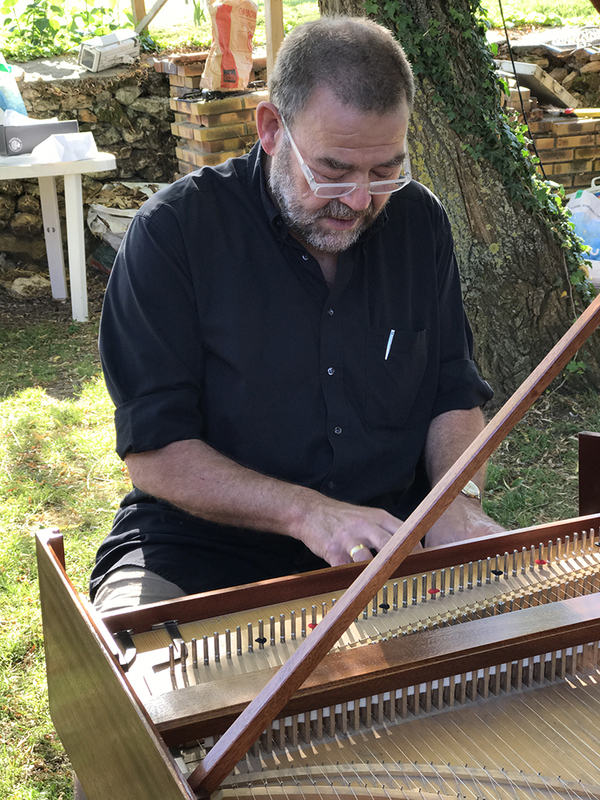 He builds, tunes and plays pianos for a living, and we enjoyed sharing stories with him and his wife. After we finished our beers and got cleaned up, we joined Nicholas, Williams and Paul -- friends we had met at the B&B the day before -- to go to a restaurant in Coincy, a little town north of Château-Thierry for dinner. They had gotten a recommendation for the place from the owner of one of the champagne houses they had visited earlier that day, and they invited us to join them. They had a car big enough to hold all five of us (barely), and we headed off for a dinner reservation at 8 pm. The plan was to be back in time to open a bottle of champagne to share with the Rieras, but the restaurant was busy and service was slow, so we did not make it back until 11:30, when Mme. and M. Riera were already in bed. The evening meal was good and very affordable. I had a salad topped with some tasty smoked salmon and an entreé of scallops with sauteed vegetables. Steve had a salad with some turkey nuggets and an entreé which I have forgotten. We shared a bottle of Riesling, which we could not finish. It was fun talking with the three guys, and they were patient in using their English to keep the conversation going. We talked about politics, motorcycles, sausages, superstitions, and our families. Back at the B&B, Steve and I tumbled into bed and remarked what an interesting day it had been with our time-travels and multinational friends. The language of friendship does not require a vocabulary or even proper sentences. Tarte Tatin is another sort of apple pie. If you leave a damp bike jersey on a hot towel-warmer too long, the ink comes off on the towel warmer.